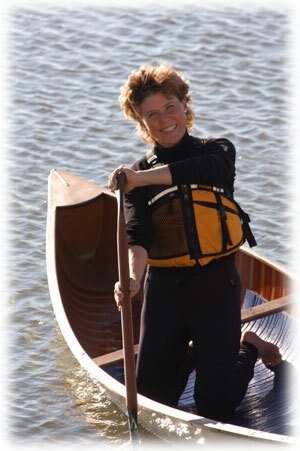 Karen Knight has been described as a “ballerina on the water.” The National Champion in Interpretive Freestyle Canoeing, from 1996 until her retirement from competition in 2000, Karen is recognized internationally for her paddling finesse and precision. Whether she is canoeing or kayaking down the Grand Canyon, dancing on quiet water with her freestyle canoe, or sea kayaking along the coast of Maine, she truly is one with the water. An accomplished paddler and innovative teacher, she currently travels with her partner, Bob Foote, throughout North America, Europe and Japan, providing instruction in canoeing and kayaking. An American Canoe Association (ACA) Kayak and Canoe Instructor Trainer, certified yoga teacher, Maine Guide, and therapeutic recreation specialist, Karen’s passion for the outdoors, especially paddling, is fueled by her love of teaching and sharing it with others. With over twenty years of experience in teaching and guiding, Karen graduated and later worked as an instructor at the Outdoor Leadership Program at Greenfield Community College in western Massachusetts, training students to lead adventure programs and trips in canoeing, kayaking, Nordic skiing, and adaptive recreation. She’s also guided and taught for L. L. Bean and was a Nordic Examiner for Professional Ski Instructors of America – just to name a few. It's Karen’s versatility, experience, dedication, and passion that sets her apart. Karen enjoys working with people of all ages, abilities, and skill levels. In addition to her degree in Therapeutic and Outdoor Recreation from Springfield College, she has trained at various adaptive sports centers in the U.S. and Norway and has assisted in the development of outdoor programs that are inclusive and accessible to people of all abilities.